Can a deathless Queen die? I loved Voyager of the Crown so, so much! Zara North is giving up her life as Agatha, a weaver in Longbourne, something she should have done a year ago. It’s hard giving up a life you’ve built with friends, but it’s time to go. Zara looks thirty-two, her friends think she’s forty-five, and she’s about to celebrate her eighty-seventh birthday. She already left behind her first life as Queen of Tremontane when she was murdered, shot in the head. She was deader than dead. Zara’s still proud of that plan that let her leave her family to take up the crown with no hint that inherent magic might run deep in the North bloodline. No one looks for you when they’ve seen you dead and buried. But while she’s moved around a bit since dying sixty years before, somehow she stayed in Longbourne longer than she intended. But now Zara is feeling freer than she’s felt in a long time. While she had planned to move to a new town, she decides that it’s really time to take advantage of her newly-grasped freedom and have a true adventure as far as she can get from where she is. So she sets out on a sea voyage to Dineh-Karit, a mysterious distant country that spurns outside contact. She’s made plans to take up a job when she gets there, she’s got her bag packed, money to pay for her ticket, and all the time in the world. What could go wrong? Zara doesn’t plan for pirates, dying spies, new-made friends, new-made enemies, and a whole lot of trekking through jungles with little to eat and too many things that want eat her and her companions. They gain the reluctant help of a grouchy healer who’d rather be helping the indigenous people. They’re going to need all the help they can get, because Zara has a Device given to her by a dying spy that she has promised to deliver in his stead. But there are pirates still on their trail as they beat their way through the deadly jungle. It’s an adventure all right – one even a deathless queen might not survive. Did I mention that I loved Voyager of the Crown so, so much?! Zara is such an incredibly strong, smart, queenly woman who has no trouble talking her way out of trouble, giving what she calls the “blue-eyed North stare” (which I picture as the mom “look” with a chill of minus 30-40 degrees added in), fighting when needed, and she’s inventing the art of dying strategically. It still hurts, though, and has a tendency to freak out those who might actually think she died. And she should probably be careful how and when she does it, because even a deathless queen can end up dead. But Zara has promises to keep and even though she’s left her wealth, rank, and family behind, she will always be Queen Zara. She can never leave behind her loyalty to her kingdom and family no matter how far the distance or how many the years. The character-building in Voyager of the Crown is fantastic with great new characters, including Belinda, a business woman who’s lost it all but who isn’t about to let something like shipwrecks and a jungle stop her, Ransom, the aforementioned healer, Theo, an apprentice with secrets, and Cantara and Arjan , a mysterious couple who are prone to lying. Well, and a couple of nasties have more than a bit part. The world-building is simply incredible, especially with the jungle villages and Dineh-Karit and the Karitians. There’s enough info about Zara and the Norths, Tremontane, Devices, and such, that you can read this book as a standalone. Of course, it’d help if you read the previous books in the series, but it’s definitely not required to understand or enjoy Voyager of the Crown. But if you enjoy Voyager and you haven’t read her other books, go grab them and start reading immediately! Each book grows the history of Tremontane and the social and political climates of the surrounding kingdoms, the tapestry of a family and nation being woven. And despite everything we learn in this book, there are so many mysteries are hinted at that could turn into books on their own. Highly recommended for those who love fantasy, steampunk, strong female characters, and all-around fantastic storytelling. I received this book as an Advanced Reader Copy (ARC) from the author. My opinions are my own. Zara North, Queen of Tremontane, has the ability to unconsciously heal herself—a magic that also keeps her from aging. Faced with the reality that public knowledge of her magic could destroy her family’s dynasty and cost them the Crown, she faked her own death and set out to make a new life for herself, far from the capital and the family she loved. Never settling anywhere for long, Zara became an exile in her own country. Now, sixty years after her “death,” Zara’s ageless face forces her to leave her home yet again. Wanting something different from the quiet life she led for decades, she sets sail for the distant continent of Dineh-Karit, reclusive and alien. When unexpected catastrophe strikes, it strands Zara and a handful of her fellow voyagers in the jungles of Dineh-Karit. Far from civilization, their only guide a reluctant Tremontanan expatriate who has his own reasons for being there, the castaways struggle for survival and to return home. But Zara, entrusted with a secret by a dying man, finds herself caught between the woman she has become and the Queen she used to be. 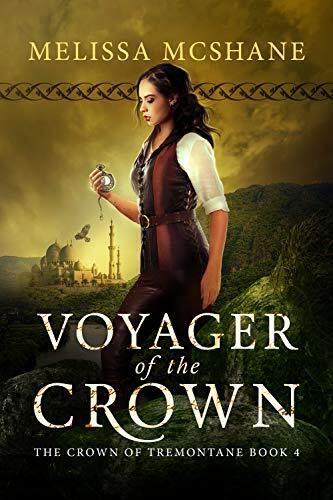 As an implacable enemy bent on retrieving the secret—a mysterious magical object—draws ever closer, Zara realizes her companions’ survival depends on Zara’s ability to lead them as she once did a nation. With an identity and a magical secret she still cannot reveal, Zara discovers depths in herself she thought were long gone—and gains a future she never expected.